Second day of orientation is in the bag, ya’ll! Today was more “serious.” They covered confidentiality issues (which includes blogging, by the way), and compliance issues. So yeah. I’m going to have to gloss over a lot of what happens at work, but I would have done that anyway. I can, in no way, talk about patients or even relate patient stories because there’s a chance that someone, somewhere, might read this and put two-and-two together and BAM – I’ve violated the confidentiality issue. They told us stories of some of the things that people have done over the years and no matter how innocent the intention was, the bottom line is, they compromised a patient’s right to his/her confidentiality. I have no idea how much, if anything, I write about work from this point on. I certainly don’t want to get in trouble or, God forbid, lose my job because of this silly journal – I’m not making any promises. I was also told today that I’m pretty much going to be required to get a flu shot. I have never gotten a flu shot and I certainly don’t want to start now. But if I opt out of the flu shot and we have an epidemic? I could be put on suspension until the epidemic is under control. It sounds crazy on the surface and UGH, but I do understand where my employer is coming from. And I certainly don’t want to put myself at risk. We’ll have to see what they say at my general checkup appointment. But I’m really hoping I can opt out of it. I really don’t want a flu shot. Orientation is over. It was a grueling two days but I learned a lot about the company and I’m really looking forward to starting at my “office” tomorrow. I’m nervous. I’ll be glad when the initial awkwardness is over. 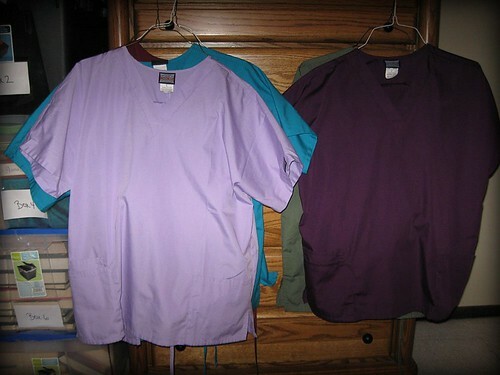 I get to wear my teal scrubs tomorrow. Also? I look like a football player in scrubs. Oh. And I almost forgot: the company’s annual picnic is this weekend. ……….. And we might go!! OMG! It’s 5:00 a.m. and I’m up. I couldn’t sleep. I woke up with a headache at 1:00 a.m. This is not that unusual for me for this time of year – whenever the weather starts to change, I get sinus headaches. The barometric pressure, I guess. So, I took an Aleve. Only that didn’t knock it out entirely, so I ended up taking an Excedrin Migraine at 3:00 a.m. this morning. I don’t know if it was the combination of medicines in my system, but I felt a SURGE of energy and now, here I am – WIDE AWAKE. I am SO going to pay for this later today. I also just can’t shut my brain down. I had my first day of orientation at my new job yesterday and it was information overload. In addition to the whole “rah-rah go company” spiel, (which actually worked on me because I’m SUPER excited to be working for this company), there was a lot of information about benefits, duties, attitudes, etc. that I needed to absorb. I also thought about what I was going to wear today (professional attire – I’m in scrubs tomorrow), and whether I should grow my hair out or not. It’s spikey now and I love it, but it’s a bit harsh and maybe I need something to soften my face? I also thought about the new website I made for a middle school that is awaiting the green light from the principal to upload and tweak in time for their Open House on Thursday. And then, of course, there was the usual worrying thinking about each individual in my family and his specific situation. Not that there’s anything to worry about, per se, it’s just a mom thing. You know what I mean, moms, right? Getting up this early reminds me that I may need to get up this early to write my novel when NaNoWriMo (National Novel Writing Month) begins in November. Because I really want to try and keep up my writing in between every thing else. I can do it, I just need the discipline (and energy) to get it done. Anyway, those are just a few of my thoughts this early Tuesday morning. How did my first day of orientation go? There were 21 people in my “class.” Which I thought was a lot, until I found out later that these “classes” used to be 40 large. The reason? This crappy economy. (Thanks Obama – for making it worse). In fact, to get off topic for a moment, I talked to most of the people in my “class” and most of them were SO GRATEFUL to even have a job. In fact, a few of the gals I talked to actually had tears of gratitude in their eyes because it had been SO LONG since they had worked and their situations were getting dire. I felt so bad for them. I mean seriously, it’s bad out there, people. And I live in the Midwest where it’s not as bad when compared to the rest of the country. I’ll tell you one positive thing about this crappy economy though, it makes people appreciate their jobs more. I’m sure every one of us will go to our respective offices and give 150% to KEEP our jobs because the competition is fierce out there. This company is hiring exactly HALF the number of people it used to hire. And given how hostile the environment is for corporate America right now? It’s little wonder that they’re hiring at all. But this is a large company and they have a lot of employees and people are retiring or there’s turn-around in positions and really, that’s the only reason they’re even looking outside the company for people. So. First and foremost? I’M SO GRATEFUL TO HAVE A JOB AT ALL. There was actually one other gal at orientation that will go to the same facility as me so we naturally sort of “stuck” together. She’ll be working on a different floor so it’s highly unlikely I will even see her at work, but still, it was nice to have an anchor, so to speak, in the midst of the chaos. The day both dragged and sped by at the same time. We had speaker after speaker from different areas (human resources, benefits, 401K, fitness, motivational, etc). come by to talk to us and give us the low-down on the company and what they expected from us. The CEO even came by to talk to us and we were allowed to ask him questions about the company. I thought that was pretty impressive. In fact, this company has new employee orientation every Monday and Tuesday and every Monday, the CEO of the company comes to talk to the new hires. I’m betting a lot of CEO’s don’t do that. I appreciated his time and his efforts. It only served to reinforce my positive attitude about the company, overall. I ate lunch with my table mates in the cafeteria. We were given a pretty hefty employee discount, which I really appreciated and because I was too intimidated to really look at the selections (because it was crawling with employees, many of them nurses and doctors) I ended up with a mini-Dominos pizza for lunch. I’m going to stick to something lighter today – probably just soup and sandwich. Speaking of nurses, there were a few new nurses in my “class.” One was going to surgery and one was going to our brand new ER. I know this sounds cheesy and cliche, but I have the UTMOST respect for nurses. They are like soldiers on the front lines and they have to put up with so much while retaining razor sharp focus in taking care of the both the patient and the doctor. If I had the stomach for it, I might even consider going to nursing school. I mentioned there are a ton of opportunities to advance in the company, and there are. Today, we sign on to their Intranet and I’m sure I’ll find out more details about the various departments through that. I’m REALLY looking forward to browsing around and seeing the whole company in the virtual sense. Everyone was super nice (which is usually the case during orientation – we’re all enthuiastic about starting a new chapter in our lives) but I got the sense that they truly enjoyed working there. It was more than the “I’m supposed to act excited for the benefit of the new hires” sort of attitude and that really encouraged me, quite frankly. You can tell when people are faking it and I didn’t get a sense that they were faking it. At any rate, I go back today for my second day of orientation and then tomorrow, I dress in my teal scrubs and I actually go to my facility to begin work. I’m nervous, but it’s an excited nervous and I just hope I can do a good job and that the ladies that I will be working with will like me. I felt so … detached from my family today. This is the first time in eight years I’ve really been away from them all. This is the first time in eight years that I haven’t been in the middle of everything that is going on. Kevin had to be both mom and dad yesterday and he’ll have to do it again today. He’ll drop Jazz off at school, but he’ll be out of the office later this afternoon, so Dude will have to pick Jazz up from school. I sort of feel like I’m watching my family live their lives from the sidelines. It’s … weird. But like I mentioned before, I think it’ll be good for everyone, actually. I think everyone has relied on me for so long that it will be good for them to fend for themselves. (Not that they didn’t before, but mom was always the back-up plan in the past). Wow. Time flies. I need to get ready to go – I don’t want to be late for my second day. Whee! It’s My Mom’s Birthday!